On Monday my old stomping grounds, aka Long Beach, outlawed plastic shopping bags. Now shoppers in the LBC need to haul their own bags to the store or fork over 10 cents for a paper bag. Just down the block from my new stomping grounds in Sacramento, the California Supreme Court ruled that environmental studies aren’t necessary in order to ban plastic bags in smaller cities. I’m all for recycling and saving the rainforests, polar bears, dolphins, you name it. But banning plastic bags impacts my ability to scoop the poop and clean up puke. And by poop and puke I’m talking about the stuff coming from my cat. There are also groups that rail against using paper bags, and studies that say paper isn’t much better. Just google “paper bag facts” and you’ll find several articles discussing the paper versus plastic debate, including this one. I use my fabric shopping bags often, especially for groceries, but on small trips I’ll get the plastic bags, mainly to restock my supply of cat maintenance materials. Maybe stores still offering plastic and paper can start asking whether I want to save the oceans or the trees. That way I can still be environmentally correct. Sort of. 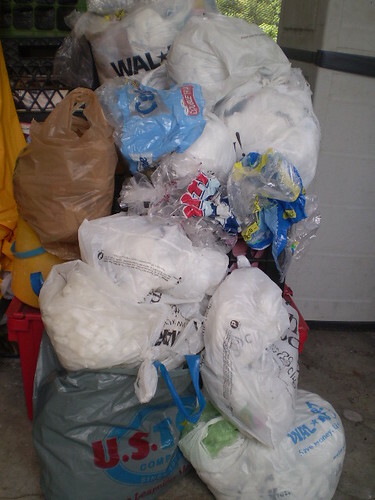 Has your town banned plastic bags? How has it changed your shopping experiences?